Manhole rings are manufactured with tongue and groove joints designed to accommodate flexible jointing compound or cement mortar. Approximate weight per metre = 520kg. PLEASE NOTE THAT THE PICTURE SHOWN IS FOR ILLUSTRATION PURPOSES ONLY. 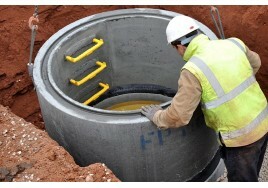 900MM DIAMETER MANHOLES DO NOT COME WITH STEPS AS THEY ARE NOT REQUIRED TO HAVE THEM.